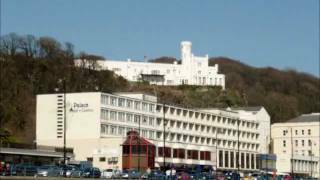 N 54° 9' 0" and W -4° 28' 59"
Douglas in Douglas with it's 26,218 habitants is a city located in Isle of Man. It's the capital of this country. Current time in Douglas is now 10:18 PM (Monday). The local timezone is named Europe / Isle of Man with an UTC offset of one hour. We know of 11 airports closer to Douglas, of which 5 are larger airports. The closest airport in Isle of Man is Isle of Man Airport in a distance of 7 mi (or 12 km), South-West. Besides the airports, there are other travel options available (check left side). There are several Unesco world heritage sites nearby. The closest heritage site is Brú na Bóinne - Archaeological Ensemble of the Bend of the Boyne in Ireland at a distance of 54 mi (or 86 km). Also, if you like playing golf, there are some options within driving distance. In need of a room? We compiled a list of available hotels close to the map centre further down the page. Since you are here already, you might want to pay a visit to some of the following locations: Kirk Braddan, Onchan, Crosby, Santon and Laxey. To further explore this place, just scroll down and browse the available info. Let's start with some photos from the area. 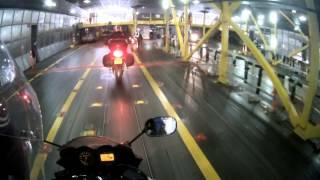 Full experience from traveling to Isle of Man during my UK trip Steam Packet ferry Manannan. 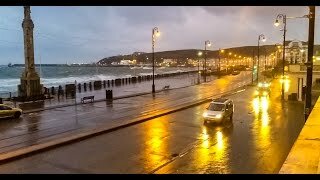 Slow Motion footage taken during a thunderstorm over Douglas on the Isle of Man, May 2011. 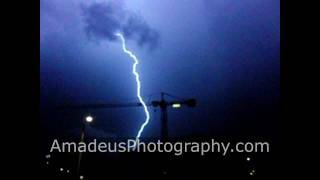 AmadeusPhotography.com. 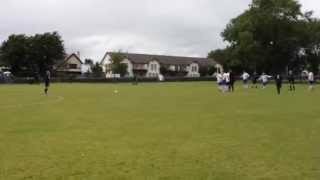 Paul Surgeon free kick to make it 5-5 v Douglas Royal 16/8/14. Combi at Noble's Park, final score Douglas & District 5-6 Douglas Royal. Douglas Promenade Isle of Man 08/04/11. 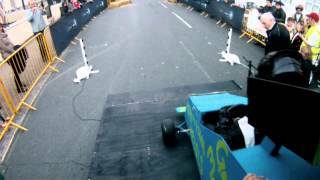 A brief overview of the 2014 Douglas Soapbox Race Powered by Microgaming. 28.05.2012 - 9:45pm Sbarco al porto di Douglas (Isola di Man) per il Tourist Trophy 2012. 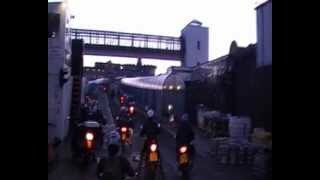 Moto: Yamaha XT1200Z Super Ténéré 2012 Nave: Manannan della Steam Packet Company Landing Douglas. Some iphone time lapse and slow-motion mixed together. 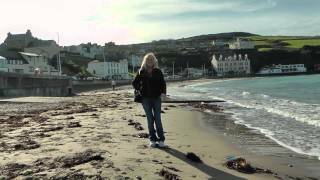 The Isle of Man, otherwise known simply as Mann, is a self-governing British Crown Dependency, located in the Irish Sea between the islands of Great Britain and Ireland within the British Isles. The head of state is Queen Elizabeth II, who holds the title of Lord of Mann. The Lord of Mann is represented by a Lieutenant Governor, but its foreign relations and defence are the responsibility of the British Government. Located at 54.15, -4.48333 (Lat. / Lng. ), about 0 miles away. The Tynwald, or more formally, the High Court of Tynwald is the legislature of the Isle of Man. It is claimed to be the oldest continuous parliamentary body in the world, consisting of the directly elected House of Keys and the indirectly chosen Legislative Council. The Houses sit jointly, on Tynwald Day at St John's for largely ceremonial purposes, and usually once a month in the Legislative Buildings in Douglas. Located at 54.1508, -4.4814 (Lat. / Lng. ), about 0 miles away. The House of Keys (Manx: Kiare as Feed) is the directly elected lower branch of Tynwald, the parliament of the Isle of Man, the other branch being the Legislative Council. Located at 54.1508, -4.48222 (Lat. / Lng. ), about 0 miles away. The Legislative Council (Manx: Yn Choonceil Slattyssagh) is the upper chamber of Tynwald, the legislature of the Isle of Man. It consists of eleven Members: Eight members elected by the Keys Three ex officio members: The Bishop of Sodor and Man The President of Tynwald (casting vote) The Attorney General (non-voting) The MLCs are elected by the House of Keys by secret ballot for a term of 4 years. Four retire every 2 years, so four MLCs are elected at a time. St Mary's Isle (also known as Conister Rock or, colloquially, the Tower of Refuge) is a partially submerged reef within Douglas Bay on the Isle of Man. The reef is situated not far from the current ferry terminal. Its eastern part, the Conister Shoals, had to be blasted away when a new harbour breakwater was built in the early 1980. The rocks are only fully submerged during the Spring high tides, in the same period, they can be accessed very briefly on foot at the corresponding low tides. Located at 54.1503, -4.46889 (Lat. / Lng. ), about 1 miles away. The Centre for Manx Studies is the main centre on the Isle of Man for the study of the Isle of Man, the Manx language, and Manx culture and history. Founded in 1992, the Centre is part of the School of Archaeology, Classics and Egyptology in the University of Liverpool. Located at 54.1483, -4.4944 (Lat. / Lng. ), about 0 miles away. Manx Radio (legally Radio Manx Ltd. ) is the national commercial radio station for the Isle of Man. The station began broadcasting on 29 June 1964, almost ten years before commercial radio was licensed in the United Kingdom. The Isle of Man, having its own government and laws, was not subject to the rules prohibiting commercial broadcasting in the UK. However, the Manx Government still had to apply to the UK's General Post Office for a frequency and for permission to broadcast. Located at 54.1485, -4.4742 (Lat. / Lng. ), about 0 miles away. The Isle of Man International Business School (Manx: Scoill Dellal Eddyrashoonagh Vannin) is an institution of higher education on the Isle of Man. The Business School is located in the Nunnery mansion estate, close to the island's capital Douglas. It provides various academic degrees and professional qualifications in many different areas of business and finance, to students from all around the world. Located at 54.1484, -4.49591 (Lat. / Lng. ), about 1 miles away. 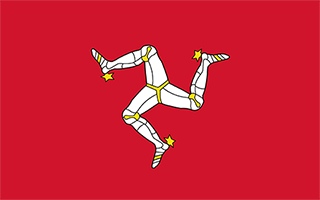 The Isle of Man Government (Manx: Reiltys Ellan Vannin) is the government of the Isle of Man. The formal head of the Isle of Man Government is the Lieutenant Governor, representing Queen Elizabeth II, Lord of Mann. The executive head is the Chief Minister. Douglas, the largest town on the Isle of Man is its capital and seat of government, where the Government offices and the parliament chambers are located. Located at 54.1518, -4.48017 (Lat. / Lng. ), about 0 miles away. Douglas Railway Station is the main terminus of the Isle of Man Railway and is located at the landward end of the quay in Douglas, the capital of the Isle of Man. It was once the hub for now closed lines to Peel, Ramsey and Foxdale. Located at 54.1478, -4.48611 (Lat. / Lng. ), about 0 miles away. Douglas East is a House of Keys constituency in Douglas, Isle of Man. It elects 2 MHKs. Located at 54.1572, -4.47722 (Lat. / Lng. ), about 1 miles away. Douglas West is a House of Keys constituency in Douglas, Isle of Man. It elects 2 MHKs. Located at 54.1603, -4.49 (Lat. / Lng. ), about 1 miles away. The Nunnery is an estate outside Douglas on the Isle of Man, named after a religious foundation on the site, at grid reference SC372754. Located at 54.148, -4.494 (Lat. / Lng. ), about 0 miles away. Douglas Southern Electric Tramway was a standard gauge tramway between the top of Douglas Head on the Isle of Man and the nearby resort of Port Soderick. The route ran atop the cliffs and crossed a number of spectacular viaducts and bridges. Located at 54.144, -4.471 (Lat. / Lng. ), about 1 miles away. The Gaiety Theatre and Opera House is a theatre, on the Isle of Man. The theatre was built in 1899 to the designs of architect Frank Matcham, as an opera house and theatre. It was built within the structure of the former Pavilion, an entertainment hall that had been constructed six years earlier. The theatre opened on 16 July 1900 with a West End production of The Telephone Girl featuring Ada Blanche. Located at 54.155, -4.478 (Lat. / Lng. ), about 0 miles away. St Ninian's Crossroads (Manx: Ballaquayle Quayle or MacFayle's farm - the quarterland of Ballaquayle) is situated between the TT Grandstand and the 1st Milestone road-side marker on the Snaefell Mountain Course on the primary A2 Douglas to Ramsey road in the town of Douglas in the Isle of Man. The St. Ninian's Crossroads is a major road junction of the A2 Glencrutchery Road with the A2 Bray Hill, the A22 Ballanard Road and Ballaquayle Road in Douglas. The area is dominated by St. Located at 54.165, -4.48361 (Lat. / Lng. ), about 1 miles away. Bray Hill formerly a country lane known as the Great Hill during the time of the ownership of the Duke of Atholl. Previously known as Siberia a former triangle shaped parcel of land in the Murray Estate. Bray Hill is situated between the TT Grandstand and the 1st Milestone road-side marker on the Snaefell Mountain Course on the primary the A2 Douglas to Ramsey road in the town of Douglas in the Isle of Man. Located at 54.1617, -4.48972 (Lat. / Lng. ), about 1 miles away. The Upper Douglas Cable Tramway was a tram line serving all points between the southern end of the promenade and the upper part of the town of Douglas in the Isle of Man. It opened on 15 August 1896 and closed on 19 August 1929. Located at 54.157, -4.477 (Lat. / Lng. ), about 1 miles away. The Loch Promenade Construction Railway was a temporary railway on the Isle of Man which ran along the southerly end of the majestic promenade at Douglas as part of the extensive widening scheme that took place at the start of the twentieth century. Running to a broad gauge and carrying a self-propelled crane it assisted in the reclamation of land which now forms the outer walkway of the promenade. Located at 54.151, -4.475 (Lat. / Lng. ), about 0 miles away. 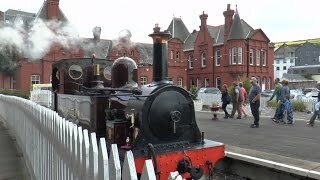 The Douglas Breakwater Crane Railway was a massive self-propelled steam crane that ran the length of the original breakwater at Douglas, for the loading and unloading of vessels. The crane was owned by the Isle of Man Harbour Board and ran on 10 feet gauge track, the broadest in the British Isles. It was in action until the 1970s. Located at 54.158, -4.474 (Lat. / Lng. ), about 1 miles away. St. Ninian's High School is a secondary school located in Douglas and Onchan, on the Isle of Man. The School is set over two different sites, catering for different year groups. The Lower School: 'Bemahague' opened in 2012 and is located in Onchan. The lower school caters for years seven to nine. Located at 54.1644, -4.48444 (Lat. / Lng. ), about 1 miles away. The war memorial in Douglas, Isle of Man is dedicated to those who died during World War I and World War II. The rolls of names are segregated by service and year of death. Located at 54.1558, -4.47747 (Lat. / Lng. ), about 0 miles away. 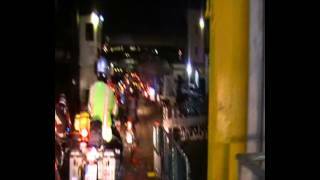 The Isle of Man Sea Terminal is the arrival and departure point for all passenger and car ferries operating to and from the Isle of Man and is located in Douglas, the island's capital. It is one of the two main gateways to the Isle of Man, the other one being the Isle of Man Airport. It is operated by the Isle of Man Steam Packet Company, which operates year-round sailings to Liverpool and Heysham, and seasonal sailings to Belfast and Dublin. Located at 54.148, -4.474 (Lat. / Lng. ), about 0 miles away. Quarterbridge Road (Manx: The Quarters or Quarter Dub – quarterlands of Ballabrooie and Ballaquayle) is situated adjacent the 1st Milestone road-side marker on the Snaefell Mountain Course on the primary the A2 Douglas to Ramsey road in the town of Douglas in the Isle of Man. Located at 54.1583, -4.49583 (Lat. / Lng. ), about 1 miles away. The former Priory of Douglas was a monastery of nuns on the Isle of Man, which, according to local tradition, was founded by St. Brigid of Ireland in the 5th century. It was the only enclosed religious order for women on the island. Established in the traditions of Celtic Christianity, the community later came under the Rule of Saint Benedict and joined the Cistercian Order, which spread from France throughout the British Isles during the 12th century. Located at 54.1484, -4.4947 (Lat. / Lng. ), about 0 miles away. These are some bigger and more relevant cities in the wider vivinity of Douglas. These are the most popular locations in Isle of Man on Tripmondo.